E-commerce is the most popular and money-making method for businesses that want to move their operations online. Therefore, one of the reasons lots of web developers made e-commerce possible on WordPress too. Free user-friendly functionality, excellent optimization, almost countless quantity of different extensions for all purposes. The best words to explain what WordPress means for its users. But in order to launch a successful online store, you need a great platform that will offer you optimal design and settings.They will fit your goals and overall business vision. WooCommerce gives the most proficient features for creating online store of your dream. WooCommerce is ready to sell almost everything – physical or downloadable goods. Chromium Cars WordPress theme is the headliner of our review. Another masterpiece from Transparent Ideas team. Furious design, powered by fantastic geometrical lines, unique color scheme and smoothy hover effects. So powerful and progressive tool that can’t be ignored. Effective well-coded functionality will take your business to next level almost immediately. It has intuitive user interface. Code is clean and done according to all recent HTML5/CSS3 statements.Chromium theme includes pre-built pages layouts that allow you to set up your online shop in an instant. It offers multiple header options, an impressive full-Screen slider with animation. 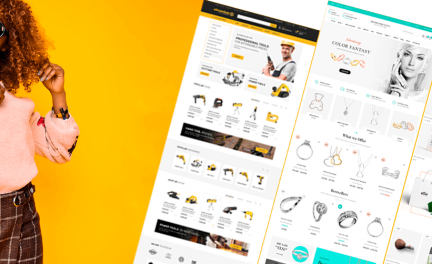 Theme comes bundled with premium plugins like Elementor contentbuilder, Max Mega Menu, Slider Revolution, AJAX Search for WooCommerce, Woocommerce Currency Switcher and other useful plugins. Polylang plugin allows integrating the second language to your site for free. Woocommerce ready functionality displays your products on your website with ease. Chromium is forced with advanced theme options that help you easily customize your website and create a design for your website that suits your brand without touching a single line of code. Numerous color and typography settings. Max Mega Menu provides intuitive navigation system. Elementor is the most progressive pagebuilder all the time and is used in this theme as well. Lots of page templates help to create needed layouts. All theme code is SEO ready. By default, theme package is equipped with One click Demo Data installation. Couple minutes and all demo content will be downloaded to your current server environment. Polite support agents are online almost 24/7 and ready to provide you with helpful support. ThemeREX is ready to represent Reisen – Auto Service WordPress Theme. It was created for car repair shops, auto mechanics, auto blogs, car accessories shop, and other websites related to vehicles maintenance. Equipped with a generous set of demo content and template pages as well. Forced with many shortcodes and widgets to manage the theme. Premium Visual Composer, Revolution Slider, WPML, Essential Grid, SEO plugin and many more. All this cool bonus can be found in default theme package. Amazing hover effects for your product images and a lightweight experience for your visitors. Reisen Cars WordPress theme is augmented by W3C valid HTML5 code and smooth CSS3 animations. Custom widgets, bundle of unique shortcodes and Interactive Ajax Search mechanism will let you have powerful and easy operated website. Reisen Cars WordPress theme looks sharp and crisp on all screens and devices. 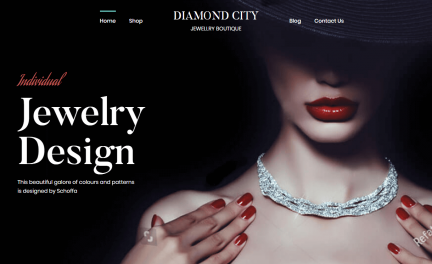 Layout is responsive and versatile with boxed/wide designs. Backgrounds are fully customizable as well. It uses incredible Google Fonts and FontAwesome functionality. Cross-browser compatibility: FireFox, Safari, Chrome, IE9+. Unlimited colors, typography options to play with. Just contact Reisen’s experienced support team and be ready to have all suggestions on the matter of this modern tool usage. Forget about doubts, give Reisen a go today. 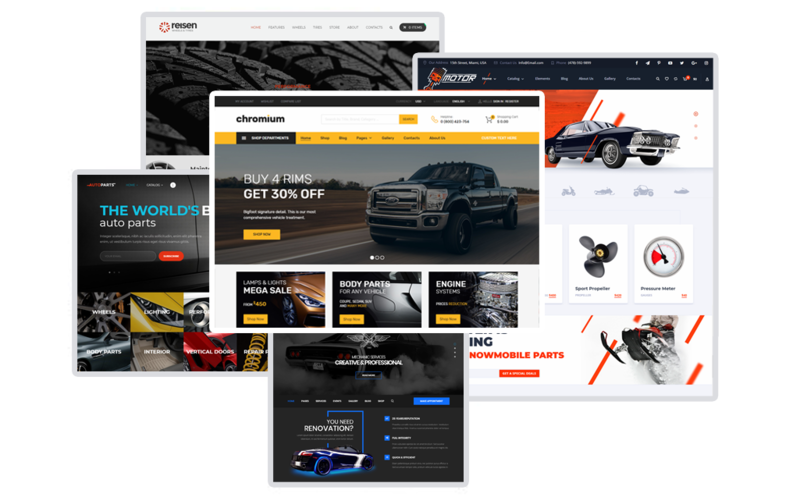 Motor is a professional WordPress WooCommerce Theme for dealers, shops and mechanics. The best theme to sale equipment, accessories, cars, motorcycles, snowmobiles and many more. Incredible Woocommerce ready platform to showcase your products to your audience. This Cars WordPress theme are forced with Visual Composer pagebuilder and +20 plugins compatibilities. 100% responsive design and even mobile menu layouts are offered. Styled Google Map Integrated. Well-documented and programmed with SEO needs in mind. Template uses semantic code. This gives fast performance and really amazing speed power. It performs well even under peak traffic. It includes unlimited sidebars, +2500 FontAwesome icons and +20 custom widgets. With all default advanced features, the possibilities are endless. Smartphones and tablets users will be impressed with the adaptive navigation system. Theme is forced with Contact Form 7, so you can simply stay connected to your target audience all the time. Demo content is provided, and it can be imported in a matter of seconds. It’s not only well documented but good-supported as well. A well-done website is one the major aspects for the growth of your business, and you’ve just come to the right place to get it! One more masterpiece from MWTemplates team is a great choice for full-service auto maintenance and auto repair services. It incorporates many really impressive features. CarRepair WordPress theme was designed to provide clarity, maximum content exposure and ease in navigation on tablet and mobile devices as well. Cool-organized code gives cross-browser compatibility. Drag and drop any section of the theme using so intuitive features of premium Unyson pagebuilder. Several well-designed demo websites let you start things off with ease. Customize your catalogs, searches, single product pages, headers and more without any coding. Even newbie can create a page with needed layout and elements in a matter of minutes. CarRepair is powered by Twitter Bootstrap v3 and optimized due to all modern web standards. Technologically powerful and WooCommerce ready. Dark/light skins and unlimited colors. Slider Revolution integration, animations from CSS3 will make your customers love it at first sight. Lots of pre-designed color schemes that you can choose anytime. SEO-friendly code will help your website rank well on major search engines on the web.Reach across the globe, with CarRepair. AutoParts is one more excellent Cars WordPress Theme that is worth to be chosen for commercial sites. Hundreds of pre-built layouts, unique menu builder and other cool features are integrated as well. Due to Woocommerce compatibility, it is great for wheels & tires shop, auto care, auto painting, auto-tuning, body shop, car care center, car show store. The theme has an attractive layout that will perfectly fit for your car business. There are so many shortcodes and widgets to manage the theme! So that your business runs smoothly. Offers compatibility with Revolution Slider as a home slider. Essential Grid galleries that allow you to display any contents as awesome grids. Speed test proves that all inner code is well-optimized and, like in other premium class themes, customizable. Default functionality is full of product banners, brand carousels, advanced vertical menu and other user-friendly elements. In case of some errors, contact AutoParts support help center. Their professional representatives will inspect everything and do all the best to resolve any issue. The price of this theme is very low, considering its superior level of quality.